Riding the Forests - Hanmer Springs Horse Riders Inc.Hanmer Springs Horse Riders Inc.
We are particularly privileged to be able to ride in the Hanmer Heritage Forest. The forest was established in 1901 by the Government on former Thermal Reserve land near Hanmer Springs. The forest originally covered 250 hectares but was later extended and now covers over 5150 hectares. It was planted with a mix of native and exotic trees in order to test how different species would perform in New Zealand conditions. The oldest part of the forest contains trees that are now more than 100 years old. The Heritage Forest is protected under a Crown covenant to preserve its character and there are a great range of walking, mountain biking and horse riding tracks to be enjoyed. It’s a special place. Which tracks may I ride on? In short, if you are able to drive a car on a track, then you may take a horse on it. Please do not jeopardize horse access to this land by riding on walking or mountain biking designated tracks. These tracks are generally marked with signs as shown below. Who has right of way on a multi-use track? When using tracks shared with other users, approach blind corners no faster than a walk because other users may be just around the corner. Pass others at a walk and keep your horse under control at all times. Respect that other users have different, and valid, reasons for being there. Anticipate other users around corners or in blind spots. Expect the unexpected; travel at a speed from which you can stop safely if a hazard arises. Do not startle other users – greet them when approaching, especially from behind. The basic give-way rule for shared-use tracks is: 4WD and other motorised vehicles give way to walkers, cyclists and horses; cyclists give way to walkers and horses; and walkers give way to horses. Common sense and courtesy prevail at all times. 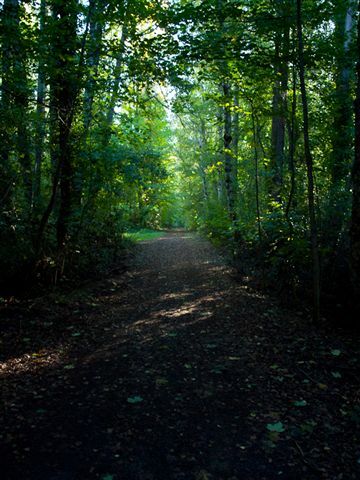 Entrances to the horse tracks in the Heritage Forest and neighbouring forests. These are at Fowlers Lane, Jollies Pass Road main entrance and Tarndale Place (see map). Note there is no public access to Pawsons (forestry) Road which runs between Jollies Pass and Clarence Valley roads. We are in the process of designing and constructing a skills park for horses and riders, the Woodlands Reserve Horse Park. We are planning obstacles along the lines of the cowboy skills challenge courses, as well as a horse labyrinth. The horse track to the Woodlands Reserve Horse Park leaves the Jollies Pass Road main entrance opposite the step-over exit from the Heritage Forest at the end of Alligator Alley. 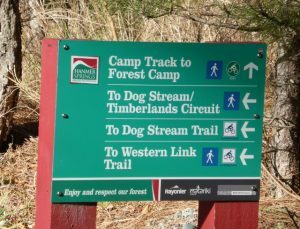 The sign-posted track follows the dirt road down and around to the left of the Hanmer Scout Den (formerly the DOC info centre), across Dog Stream and up to the large grassed area. Cross the open grassed area to the Horse Park which is the stand of black poplars at the base of Conical Hill. Please do not ride on the footpaths for walkers.